Have I mentioned that I love the fall? Well, if not, then I LOVE the FALL!!! And one thing I love about the fall is all the yummy pumpkin goodies there are to eat (oh and drink, because who doesn’t love a nice hot pumpkin spiced latte from SB :)). I have a huge list of pumpkin yummies that I hope to make between now and Thanksgiving and I plan to share my adventures with you as I go. This pumpkin bread is simple and VERY easy to whip up and throw in the oven for a nice warm treat any time of day. 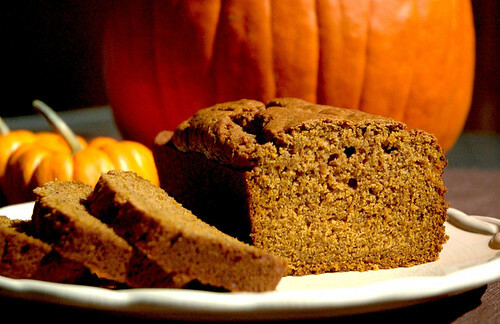 It is moist and the spices are the perfect balance with the pumpkin. I usually make my pumpkin bread nut-free, however, feel free to add your favorite nut for some crunchy goodness in each slice. Cream sugar and butter together in a large mixing bowl. Beat in eggs and pumpkin until light. Stir in dry ingredients until well blended. Bake in greased 9×5 pan for 45 minutes or until toothpick comes out clean. Cool for 15 minutes in pan, then turn out onto a cooling rack and allow to cool completely. I recieved this recipe from a friend and modified it slightly, not sure of it’s original source.